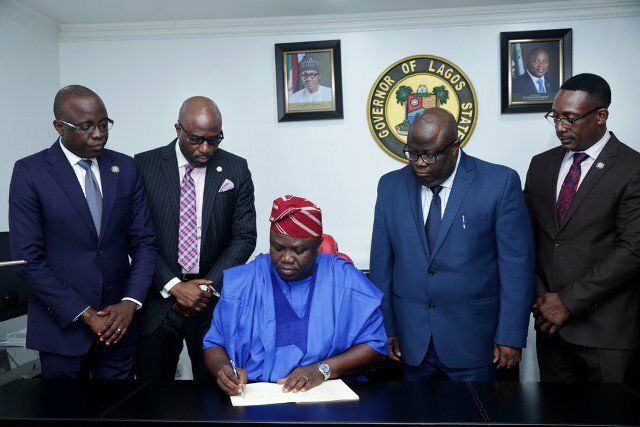 Ambode signs N1.046tr 2018 budget into law – Royal Times of Nigeria. Lagos State Governor, Mr Akinwunmi Ambode on Monday signed the 2018 Appropriation Bill of the State into law with a total budget size of N1, 046,121,181,680.00. The total budget size comprises of N347, 038, 938, 872.00 to be funded from the Consolidated Revenue Fund, and N699, 082, 242,808.00 from the Development Fund for both capital and recurrent expenditure for the year ending 31st December, 2018. Commissioner for Economic Planning and Budget, Mr. Olusegun Banjo outlining the key components of the budget, said capital expenditure would gulp N699.082billion, while N347.039billion would be dedicated to recurrent expenditure, representing a Capital/Recurrent ratio of 67 per cent to 33 per cent and a 28.67 per cent increase over Y2017 budget. He also listed key projects captured in the 2018 Budget to include the Agege Pen Cinema flyover; alternative routes through Oke-Ira in Eti-Osa to Epe-Lekki Expressway; the 8km Regional Road to serve as alternative route to connect Victoria Garden City (VGC) with Freedom Road in Lekki Phase I; completion of the on-going reconstruction of Oshodi International Airport Road into a 10-lane road and the BRT Lane from Oshodi to Abule-Egba. According to sectoral breakdown of the budget, General Public Services is earmarked to gulp N171,623bn, representing 16.41 per cent; Public Order and Safety, N46.612bn, representing 4.46; Economic Affairs, N473,866bn, representing 45.30 per cent; Environmental Protection, N54,582bn, representing 5.22 per cent, while Housing and Community Amenities got N59,904bn, representing 5.73 per cent.